Madhav Naturopathy and Yoga Medical College and Hospital (MNYCH), established in 2015, is working for the health services of tribal and other population of country specially western Rajasthan. MNYCH is surrounded with multiples of naturopathy and yogic practices which provide direct benefits to students to learn the basics of the system. This modern edifice stands as a tribute to an ancestry of aesthetic sense; and imparts knowledge in all branches of the ancient art of Nature Cure and Yoga. Naturopathy is the branch of life science that is centred on the body’s own healing ability. It is essentially about body’s self-cleaning and repair without the use of medicines, body's immune, hormonal, nervous, and excretory systems, the body’s adjustment and alignment with these systems and naturally healing diseases pertaining to these systems in the body. Qualified Naturopathic Physicians typically work at clinics with patients, analyze symptoms, problems, and medical statuses, personalize treatment protocols for every patient, study the patient's lifestyle habits and scan patients’ ailments/allergies to find clues responsible for the current state. The discipline is relevant for those wishing to escape the various side effects and allergies caused by allopathic medicines. Undergo natural methods of healing, like medicinal plants and controlled diet and yogic practices. Faculty is offering various certificate, diploma and bachelor courses in naturopathy and yoga and follow discipline, strict student’s attendance, teaching of moral character and latest audio visual mode of teaching with extracurricular activities. Departments are fully versed with basic as well as latest equipments, models, charts, specimens and alternative therapies. To effectively integrate the conventional basic sciences with the traditional medical systems and to enhance the understanding of the subject. To provide state of the art learning facilities (e.g. audio visual aids, interactive learning systems) to conceptualize the ancient medical system. To run advanced laboratories under basic and clinical science for effective experimental training and research. To explore the possibilities of promoting effective integrated medical practice at conventional medical facilities attached to the institute. To prepare every naturopathy and yogic student with an in depth understanding of basic sciences, superior clinical training and with an outlook for research and development. To provide low cost treatment to poor and needy through its hospital. Each subject includes theory and practical examination. Madhav University is situated near Mount Abu valley which is fully surrounded by nature’s beauty, peace and free from the pollution and which is perfect for the system of naturopathy and practice of yoga and this also provides best environment for the patient to heal themselves. This university is established by the Act No. 7 of 2014 of State Legislature of Government of Rajasthan and it is one of the best private university in Rajasthan. It provides all the facilities of College and Hospital. Laboratory for subjects like anatomy, physiology, pathology etc. Madhav Naturopathy and Yoga Hospital, established in 2015, is first of its kind in naturopathy in western Rajasthan. All modern diagnostic methods are used to get a proper, precise diagnosis along with naturopathy, yoga therapy, acupuncture, physiotherapy, chromo therapy treatments and other supported therapies like panchkarma and ayurveda treatment which are combined together to benefit the needy. Well established and separate wing in hospital for Hydrotherapy section, Manipulative therapy, Acupuncture ,Physiotherapy, Mud therapy, nutrition and diet counselling, yogic counselling and meditation hall ,Psychological counselling. The college provides various scholarship schemes as well as merit based scholarships Slike University Merit Scholarship, National Loan Scholarship, Educational Concession under KPCR, SC/ST, OBC, etc., Other Awards and Endowments. Employment in govt. sector like in Ministry of Health, Ministry of AYUSH, research council like Central Council for Research in Yoga and Naturopathy (CCRYN), National Institute of Naturopathy (NIN) Pune etc. Madhav Ayurvedic Medical College and Hospital (MAMCH) is working for the service of tribal & other population especially of western Rajasthan. MAMCH is surrounded with multiples of medicinal plants species which provide direct benefits to students to learn the basics of Ayurveda medicines. Ayurveda is a holistic healing and wellness science that was passed on to the Indian Sages or Rishis from the Gods themselves. Its primary emphasis is on prevention of disease and maintenance of health. Ayurveda has primarily a promotive and preventive health care life science. Ayurveda is the ancient Indian traditional system of medicine and health care practiced in India for thousands of years and provides health care coverage to a large segment of the Indian population even today. Ayurveda Faculty is offering various job oriented certificate, diploma and bachelor courses in Ayurveda science. Faculty maintains discipline, strict student’s attendance, teaching of moral character and latest audio visual mode of teaching with extracurricular activities. Departments are fully versed with basic as well as labs with latest equipments, models, charts and specimens. Ayurveda is a 5000 years old system of natural healing that has its origin in vedic culture of India. It provides guidelines on ideal and seasonal regimes, diet, behaviours and the proper use of senses. Ayurveda reminds us that health is the balanced and dynamic integration between our environment, body, mind and spirit. It not only deals with physical health and healing but it’s a way of life that can help each of us to claim and celebrate our capacity for the fully embodies senses of wellness. To effectively integrate the conventional basic science with the traditional medical system and to enhance the understanding of the subject. To provide medical care through Ayurvedic system of medicine to the suffering humanity with low cost treatment to the poor and needy through the hospital. To run advanced laboratories under basic and clinical science for effective experimental, practical training and research. To prepare every Ayurveda student with deep understanding of basic science, superior clinical training and with an outlook for research and development. To provide quality of education (e.g. audio visual aids, interactive learning system etc.) and health care services without any discrimination. The college has comprehensive facility for teaching, inexhaustible resources for medical and allied research and provides credible patient care. The basic or degree (graduate) level qualification for Ayurveda medical profession is Ayurvedacharya (Bachelor of Ayurvedic Medicine and Surgery-BAMS) which is of 5 1/2 years duration (including 1 year internship), which is equal to the duration of MBBS course. Ayurveda is one amongst the most blissful career for those who have concern for mankind and a dream to serve ailing humanity in order to prosper with real success in life. More than 500 medicinal plants species are available in short radius of Madhav University especially at Mount Abu Region which provide help to improve Ayurveda basic knowledge direct through nature with ease. Medicinal plant tours will conducted by college in every month to improve the student’s knowledge about plant identification, Habitant, medicinal uses etc. College also provides well established Pharmacognosy and Pharmaceutical Laboratories for drug research and also has well designed Anatomy and Physiology lab with all modern equipments. Highly qualified and experienced faculty members to ensure the understanding and the depth of life science. A well-equipped hospital with 125 beds in patients department along with good nursing provides complete exposure of the practical knowledge to the students which ensure best clinical understanding. It has a big and well ventilated lecture hall with modern audio visual facilities with a seating capacity of 100 students. It has a separate administrative and academic wings to facilitate the efficient and effective working. College is located near Mount Abu which is fully surrounded by nature’s beauty, peace which is free from pollution and crowd and thus creates concentration in learning and improves the understanding abilities of the student. It is also easily accessible through various means of transport from all over the country. As the College is known as RAGGING FREE CAMPUS, thus providing good environment to enjoy the GOLDEN STUDENT LIFE. Madhav Ayurveda Hospital established in 2015, is first of its kind in Ayurveda in western Rajasthan. All modern diagnostic methods are used to get a proper, precise diagnosis along with classical Ayurvedic treatments and other supported therapies like Physiotherapy, Homoeopathy, Occupational therapy. Yoga & Naturopathy are combined together to benefit the needy. Well established and separate wing in hospital for Panchakarma unit with Automated and Semi-automated Shirodhara Machine, Sarvanga Dhara, Steam Bath Chambers, Sun bath Area, modern equipments for Basti therapy, Nasya therapy etc. A variety of teaching and learning techniques are employed to impart knowledge and skills to students at Madhav Ayurveda Medical College and Hospital in its various departments. The college provides various scholarship schemes as well as merit based scholarships. Few are University Merit Scholarship, National Loan Scholarship, Educational Concession under KPCR, SC/ST,OBC etc. And other Awards and Endowments. “Somewhere the professional may get money somewhere the profession becomes just Dharma of service to society some where it creates friendship somewhere it gives name and fame and if none of the above is available it will certainly produce the practical experience of studied material. Accordingly the profession of treatment is never fruitless”. There were various options available for freshly graduated doctors in Ayurveda few years back that is just to start own practice and join in the limited state government and local body (District board, Municipal boards/corporations and Mines} Ayurveda Dispensaries. However, today there are many promising opportunities available to Ayurveda graduates not only in India but also in other countries of the world. The areas which are available to build a career can be broadly classified as follows. 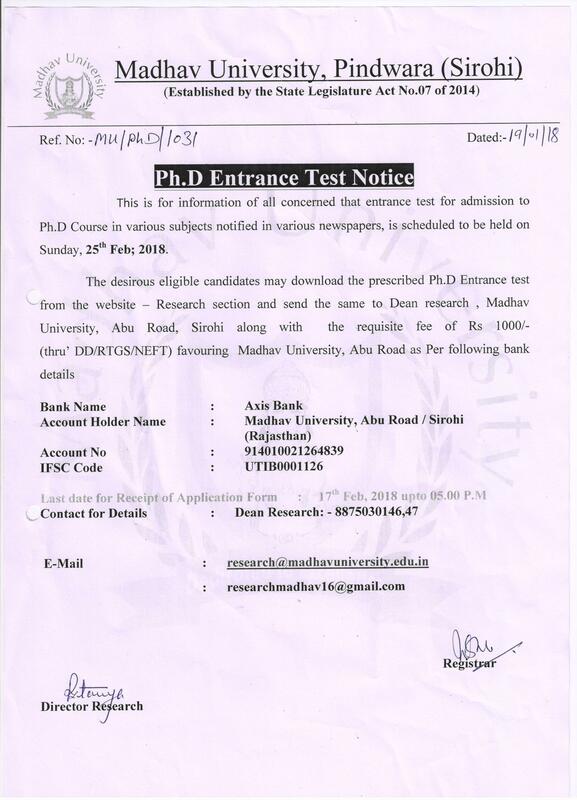 Junior/Senior Research Fellow (JRF/SRF) in various research projects sponsored by Governments.